As the UN Convention on the Rights of the Child celebrates its 30th year in force, Women’s Aid Organisation (WAO) is launching the first report to highlight the experiences of child domestic violence survivors in Malaysia and underscore the need for child rights to be integrated into domestic violence response. The WAO case study report, entitled ‘Where’s the Child? The Rights of Child Domestic Violence Survivors,’ includes 21 case studies illustrating the varying experiences of child domestic violence survivors, including those who have directly experienced abuse or witnessed the abuse of their mother by their father. “The needs and best interests of the children are sometimes overlooked in domestic violence response,” said Sumitra Visvanathan, Executive Director of WAO. The ‘Where’s the Child’ report advocates for a rights-based approach to domestic violence response, grounded in the four guiding principles of the UN Convention on the Rights of the Child (CRC). “The CRC emphasises the principles of non-discrimination, participation of the child, upholding the best interests of the child, and the child’s right to life, survival and development,” said Sumitra. The WAO report strives to help the reader understand the current legal framework and available protection mechanisms for child survivors of domestic violence. It also seeks to help the reader understand the experiences of child survivors in enduring domestic violence and seeking assistance to escape it. Finally, it makes recommendations to a variety of stakeholders as to how they can promote the best interests of the child in preventing and responding to domestic violence. Among these recommendations is one to the police to automatically include child survivors who witness domestic violence in the referral letter for an IPO, recognising the trauma and harm that come to children from living in a violent household. Another recommendation, directed at the Ministry of Education, is to mandate teachers and school administrators to report domestic violence and child abuse where the child’s welfare is deemed to be at risk. According to a global study by UNICEF, around 275 million children worldwide are exposed to domestic violence, and this is a conservative estimate given the chronic underreporting of domestic violence and the lack of data around how many children are affected. While the exact number of children in Malaysia who have witnessed or experienced domestic violence is unknown, according to a study by Universiti Sains Malaysia’s Centre for Research on Women and Gender, of the 9% of ever-partnered women in Malaysia who have experienced domestic violence, 73% of these women reported that their children had seen or heard the violence in the household. This is equivalent to the children of 584,000 women having witnessed domestic violence. 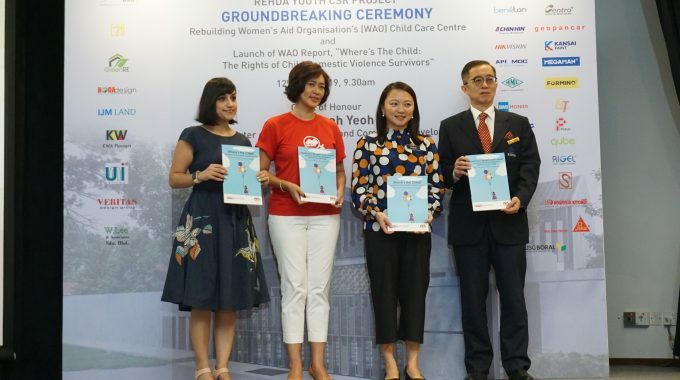 The ‘Where’s the Child’ report was launched by YB Hannah Yeoh today in conjunction with the groundbreaking of WAO’s new Child Care Centre, which is being undertaken in partnership with the Real Estate Housing Developers’ Association Youth Malaysia (REHDA Youth). “We’re excited to share the learnings from our research with policymakers and key stakeholders,” said Sumitra. ‘Where’s the Child: The Rights of Child Domestic Violence Survivors’ is available at https://wao.org.my/publications/wheres_the_child/.